For a very long time I haven’t approached Creed. There were several reasons for that. First, when I didn’t know anything about the brand, its line-up in Neiman Marcus looked so unapproachable that I would keep passing the Creed’s counter long after NM itself stopped being intimidating (though it’s still to expensive for me to shop there). Later, when I already knew about Creed, in my mind it was closely connected to the testosterone overdose coming from the certain forum and some Facebook groups: all those batch numbers and bottles parts’ details were just making me nauseous and didn’t inspire the exploration. I was bored. There was absolutely nothing new for me to sniff at the local Neiman Marcus. Because of my previous success with gardenia perfumes – Guerlain Cruel Gardenia and Ineke Hothouse Flower – I was mildly curious about the new Creed’s Fleurs de Gardenia. They didn’t have it yet but it was too late: I “left myself open” and Creed’s SA, who looked like she also was quite bored, decided it was her chance. For the next fifteen minutes she was enticing me with different scents on paper strips, names and notes. I decided not to fight back and compliantly stood there nodding. I must have fulfilled my part of the SA-potential client dance so she easily agreed to make a sample of the perfume that I liked the most – Jasmin Impératrice Eugénie. I wonder how Jasmin Impératrice Eugénie smelled 160 (one hundred and sixty!) years ago when, according to the official legend, it was created by Henry Creed II for the wife of Napoleon III, Empress Eugenie? I suspect it had been reformulated multiple times even before its public release in 1989 and definitely more than once since. But I’ve never smelled any of previous Jasmin Impératrice Eugénie reincarnations so no regrets here. Official list of notes includes bergamot, Bulgarian rose, ambergris, Italian jasmine, vanilla and sandalwood. For a while I didn’t smell jasmine in Jasmin Impératrice Eugénie – until I tried it in parallel with Dior‘s Grand Bal. Now I can clearly detect it. But still for me this perfume isn’t about jasmine. This perfume is jasmine wrapped into and creamy sandalwood with just a hint of vanilla. I can’t detect rose but I’m not too good with that note when it’s not in a leading role. Jasmin Impératrice Eugénie is very smooth and well-blended. It has a good projection so it’s not one of those perfumes in which you can bathe. It stays on my skin for about 8 hours during which it doesn’t change much to my nose (though I’m positive that at least a couple of my readers would be able to parse out more distinct stages). I like this perfume very much. My vSO also likes Jasmin Impératrice Eugénie. I know that not because he gave it to me as a New Year gift (I had a hand in it) but because he complimented me on three separate occasions (which doesn’t happen too often) without knowing what I was wearing (which does happen a lot). Do you have a favorite Creed perfume? 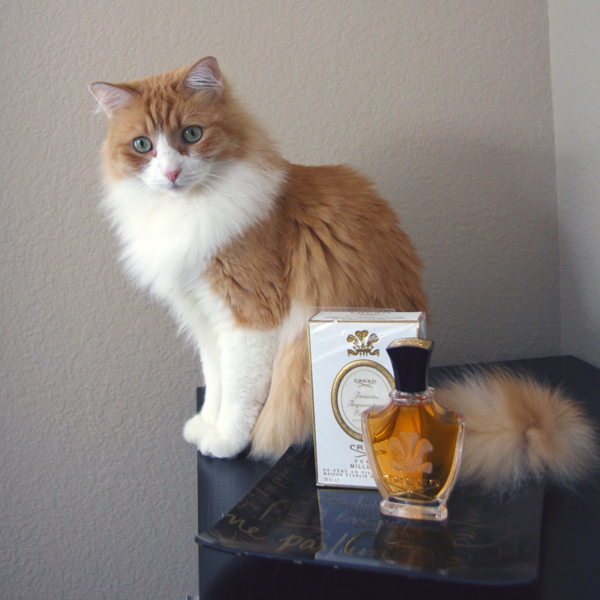 This entry was posted in "Four legs good", Attempt at a Review, Favorite Perfumes and tagged Creed, Jasmin Imperatrice Eugenie. Bookmark the permalink. Three compliments, same guy? You are on a WINNER!! He he he Rusty looks so chuffed with himself there, asking you if that’s what you want with his eyes. What a stunner. Please give him a treat from me and give yourself a healthy spritz of whatever takes your fancy, from me also. Rusty was unusually cooperative with this perfume: he patiently sat there while i was taking pictures (usually he turns away as soon as he realizes I didn’t just leave things for him to play but want to get something out of it). Thank you, Renee. I’m glad we feel similar about this perfume. Undina, that sounds absolutely lovely! 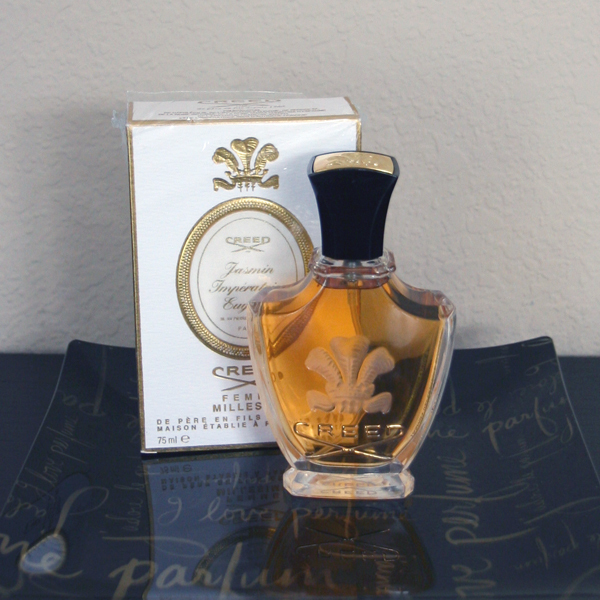 My favorite Creeds are Fleurs de Bulgarie and Fleur de The Rose Bulgare. (which is now discontinued). I love rose! Now, when I broke out of my no-Creed zone I might start trying other Creeds. Nice choice, Undina! I’m happy to say that I have the large cylindrical bottle of this beautiful perfume. *I decant it into a smaller 1 ounce spray bottle.) Every time I wear it, I love it more! Did you actually buy that huge bottle for yourself or was it a gift? (I’m just amazed every time somebody buys a big bottle when a smaller one is available). Hello Undina and Rusty, you too down there! I’m happy you found a Creed for yourself. I have to admit that I made several approaches towards creed perfume but either I had a terrible luck chosing perfumes there were ultimate scrubbers for me, either the entire (or almost entire) brand is impossible to wear. The perfumes I tried shared the unplesant (to me of course) element, some kind of a signature thing. So I gave up on Creed! But it’s fine. Moreover I treat the brand as something for older, mature man, not for a 20-something guy like me. I have some other brands I covet hell lotta more. I am grinning at how you “left yourself open.” :) That is exactly the right description. Even though I “like” many fragrance SAs, any sign of weakness or hesitation is sure to lead to a pounce! In this case, I am glad it had a happy ending, and glad you directed me to try this one. I liked it on the card, so I’ll track it down and spray on skin next time. When you do, let me know if you like it. I must say I have long been overfaced by The Creed selection and more or less tuned out to it all together. I do like Sublime Vanille, though it is rather one-dimensional, and the rose ones Bloody Frida mentioned – the discontinued ‘The (tea!) Rose’ in particular – and that’s all I can think of off the top of my head! Congrats on your new bottle – think I would like this as much as you just from your description. Sorry – iPhone malfunction – that should be ‘the Creed’ selection – it’s not a religion after all. I’m sure you will, especially if applied with a light hand. Now I’m thinking about checking the roses in the line – at least not discontinued one(s). i gave my husband a bottle of Creed Royal Oud because I thought it would be great on him. We both love it as it’s powerful and masculine which is great for meetings in the office. The nice thing about Creed too is that if you do your shopping correctly, you can get a pretty good deal on certain in their lineup. Enjoy your lovely new fragrance! Thank you, Steve. I’m not sure I’d like the one you chose (agarwood being a challenging note for me) but if I see it at a store I’ll test it to see what you liked. BTW, Rusty is darn cute as usual. I’ve always steered clear of Creeds for similar reasons to you. I’m glad when you finally explored the line you came out with a winner. Sounds like it really suits you. Rusty looks suitably regal sitting beside the bottle too. Congratulations on scent that has garnered so many compliments from the one gent (and such an important one at that too!). AS to a favourite Creed, I have a strange fondness for Fleurissimo a powdery tuberose and violet floral that has something of a bouquet feeling (that is very blended) about. Rather appropriate when you consider that it was created for Grace Kelly’s wedding day. It’s something of an oddity now, which is perhaps why I like it. Of course, I haven’t even heard that name. But since tuberose and I do not see eye to eye in any perfume I should probably just take your word for Fleurissimo. Maybe one day I’ll read a perfumed letter about this perfume? I like the older Creeds better then the current, JIE is probably the one a like the best maybe because I get compliments at work when wearing it. To me it’s mostly a sandalwood complemented with jasmine and the rest. Other Creeds i like is Vanisia, sort of airy, smokey vanilla and the iris & green Irisia. Rusty really match the color of JIE, very cute picture. Thank you. I also told Rusty that he looked well color-coordinated with the bottle. Irisia? I’ve never seen/tried this one. I should give it a try when I see it. Woweee, Jasmin Imperatrice Eugenie sounds fabulous! The next time I’m at a Chanel boutique, I will try being compliant to see if they open up the samples vault :-). Congratulations on the new bottle and a very pretty one (AND color-coordinated with Rusty) at that! Prior to the SFA NYC flagship store’s beauty floor renovation, Creed had a coveted placement facing the outer perimeter. The counter was loooooooong and all the Creed bottles were lined up on top of the counter at the same height, not a very inviting display, in my opinion. Anyway, besides participating in a basenotes split of Jardin d’Amalfi (I NEEDED to know why 3 bottles filled up really quickly and I still don’t know why), the only time I subjected myself to smelling the Creed line was when I was curious enough about a fellow coffee drinker’s perfume and asked her straight out what perfume she was wearing and she said Creed Santal Imperiale. Besides Santal Imperiale, the other one I liked was Silver Mountain Water. Hajusuuri, compliance is necessary but not sufficient condition. You have to look like a) you know something about the line but not much (unless you’re interested only in the latest one – then you can know all about the older line-up and discuss your favorites with the SA) ;) b) you are a potential buyer and c) you are an unsure and hesitant customer. And don’t give them an easy way out: “Do you have a sample of this one?” – “We’re out of samples”. If I want a sample in those places where they make samples, I ask it in the form: “Can you please make me a sample of this one?” (and if they say they are out of sample vials I always offer my own – it’s much harder to say No the second time). Places that have only official samples (like your theoretical Chanel boutique) are harder but still doable: “This one (two) seems really nice – I’d like to get samples to try them at home”. Yikes, it sounds like I need to practice for my sample-winning performance ;-) ! Can’t I just look cute like Rusty and bat my eyelashes? Once I saw a cat on a leash at Nordstrom. He was completely calm and poised. This is one of the only Creeds I like, and would even consider a bottle. I too feel overwhelmed at the counter, too many to sniff and too many stories! I do have a soft spot for Fleurissimo. You are the second commenter who mentions Fleurissimo. I should try it. I’m not very familiar with their perfumes but I’ve tried Green Irish Tweed and Aventus. Both for men. I love Green Irish Tweed and would wear it even myself. But the price is a bit too much for my budget. Aventus is also great but somehow not so special like GIT. I haven’t tried GIT (and for the longest time I had no idea what that abbreviation meant when I saw it in groups’ discussions :) ) and I liked Aventus on my father. Aventus is very nice, but I prefer GIT. I didn’t know the abbreviation existed. I just got tired of typing it all the time ;-). I agree with you, Sigrun, and Tara: the almost fanatical conversation about batch numbers and bottles baffles me and makes me avoid the entire line! Also, for a while, they used to have the entire line available for sampling in the Men’s and Women’s powder room (read toilets) in the basement of the restaurant Balthazar (there was an attendant there to make sure you didn’t walk off with the bottles). I know there are some good ones in the line (Original Vetiver I really like), but I can’t shake image of toilets + Creed. However, you an Rusty have encouraged me to give JIE a go! Please try it! I wore it again today and it’s sooo pleasant! Will do! On the must-sniff list it goes! Also, my mother is a jasmine freak so I’m always on the look out for possible perfume gift options. Thanks for the great review, Undina! Will keep you updated! Ah you found a Creed to like! My favorites are Bois de Portugal and the gone but not forgotten Angelique Encens. Imperatrice is very elegant. I haven’t tried either of those but now I’m much more inclined to explore the line.